JL Legacy Presents… | Junior League of Tucson, Inc. 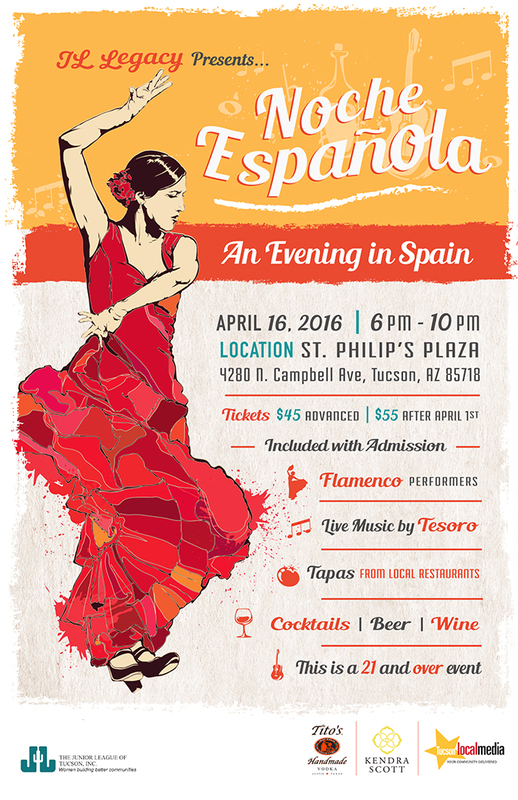 The Junior League of Tucson’s annual fundraising event JL Legacy Presents… Noche Española, will bring the captivating energy of Spain to St. Phillip’s Plaza on Saturday April 16, 2016. Guests will experience an evening with flamenco music from the live band Tesoro, flamenco performers, signature cocktails, and Spanish style culinary offerings! Admission includes 2 drink tickets, plus unlimited food sampling from 17 local vendors! Last year our JL Legacy presents… NOLA Nights event SOLD OUT and was a smashing success. You will not want to miss what we are bringing to Tucson in April 2016!